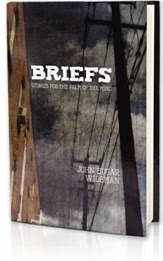 While we wait for the 2010 entries to roll in, here (as we've done before) are some notable news briefs about short stories and short story collections. The winner of The Sunday Times EFG Private Bank short story award is New Zealand writer C.K. Stead for his story "Last Season's Man." At £25,000, this is probably the largest prize for a single story. Sherman Alexie's story collection War Dances has won the prestigious annual $15,000 PEN/Faulkner Award. Another short story collection, Lorraine M. Lopez' Homicide Survivors Picnic was a finalist, adding to the list of 2009 short fiction titles honored as book award finalists. Alexie's collection, by the way, was not entered for The Story Prize. Author John Edgar Wideman has self-published his latest book, a story collection, Briefs: Stories for the Palm of the Mind (inspired by Kawabata's classic Palm of the Hand Stories), on the Lulu site. Lulu has also brought back into print much of Wideman's back-list. Mark my words, this is one way disintermediation is going to play out, and more authors are likely to go the do-it-yourself route. Esquire magazine has published a story by MFA student and movie star James Franco, "Just Before the Black." 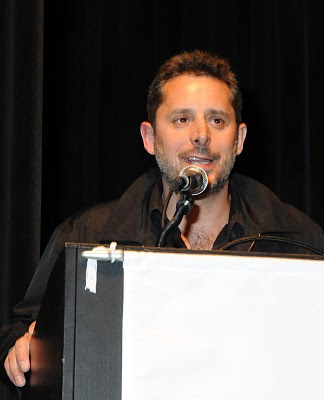 Scribner will be publishing Franco's collection Palo Alto in September. Another actor, Gene Wilder, has a collection just out from St. Martin's Press, What Is This Thing Called Love. And let's not forget Sam Shepard, who earned his rep as a writer before gaining fame as an actor. His book, Day Out of Days, is on shelves now from the good folks at Alfred A. Knopf. Soon to come: PEN/Malamud and the Pulitzer Prize, which I'm hoping a short story collection will once again win (though I'm not holding my breath). I've set an ambitious goal for this blog. 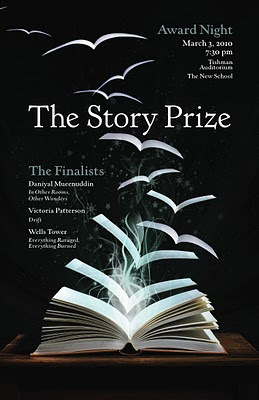 I hereby pledge to write a post about every single book entered for The Story Prize in 2010. The posts may be observations about the book, a focus on design, a Q&A with the author, an author essay, a book trailer--who knows. I hope this will bring a little more attention to a lot more story collections. Last year we read 78 of them, and I expect about the same number this year. So brace yourselves. 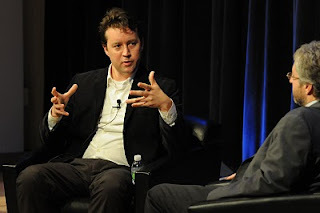 The video of The Story Prize event, which took place a week ago today, is up on The New School's YouTube page. FORA.tv will also post it, probably with some technical enhancements. This collection represents a significant achievement in the short story form. Wells Tower brings a distinctive, original voice whose power is at once reminiscent of the great practitioners of the short story (Cheever and O'Connor come to mind) while being uniquely his own. His fine balance of visceral tension, absurd and quirky humor, and richly drawn characters serves to showcase his immense talent. The plot is almost always secondary in these stories. Rather, the reader is drawn in because of the raw, essential energy created by the interaction between (and often within) characters as though by a gravitational force. Tower is able to draw characters with a deft, almost sleight-of, hand. He takes the old writer's edict "show, don't tell" one step further—his keen eye for observational detail direct the reader's attention, however briefly, to the minutiae in the background of the scene he has painted. Once the perspective has returned to the foreground, the characters then appear three-dimensional, more nuanced and fully rendered. This is the kind of writing that rewards close reading and rereading. As with all forms of magic, we are compelled to pull open the curtain in order to see how the illusion is created. Wells Tower is a deliberate, knowing author, completely in control of his stories. One notes the careful choice of language, each word selected for its specificity and efficiency. One senses that, like Chekhov's, a Tower story is no more and no less than it could otherwise be. These stories are a pleasure to read because they elicit reader participation—the dialogue is spot-on yet suggestive of all things left unsaid, the humor is wry with a sly, sophisticated wink and the subtle building of tension elicits a sensation similar to that of a spring about to be sprung. There is a physicality to these stories that leaves a mark on the reader. One feels so completely engaged, so immersed in the story that it is tempting to suggest that our own energy has somehow been tapped in order to bring the story to life. With a steady hand and a gimlet eye, Victoria Patterson proffers a surprising vision of a familiar world in her story collection, Drift. The very idea of a literary work of fiction set in notoriously materialistic Newport Beach, Calif., is perhaps one of the biggest surprises. But Patterson makes it work through skillful writing that shows us the gritty side of the glitz and deftly peels back the layers to reveal the inner core of characters struggling to fit in or to define themselves within a wealthy, vacuous, and sometimes toxic culture. Part of the pleasure of reading this book is growing familiar and fond of the characters that appear throughout the connected stories, and I missed some of them the moment I finished the book. This is a deft, fully realized work of fiction made up of disparate parts that nonetheless cohere to reveal a complex world full of pain, regret, and no easy answers. It is an impressive accomplishment, a book of great depth and unquestionable authenticity. When the three judges for The Story Prize make their choices, they provide citations for the book or books they like best. This year's judges were author A.M. Homes, critic and blogger Carolyn Kellogg, and librarian Bill Kelly. We include the citations in congratulatory letters we present to each finalist, along with their checks ($20,000 to the winner, $5,000 to the other two finalists). To protect the confidentiality of the judges' votes and the integrity of the process, we don't attribute citations to any particular judge. In eight textured stories that stretch across decades, Daniyal Mueenuddin illuminates feudal Pakistan and its decay. Whether he's writing in the contemporary moment or of times long past, he evokes characters with empathy and a clear eye; their choices feel vital, hopeful, wrenching. Each story, on its own, shines; layered together, there is a celebration of the beauty of the landscape, humor in the everyday, the irrefutable power of family and a lingering sadness for all who have not gotten quite what they wanted. The eight stories in In Other Rooms, Other Wonders, are woven together to create a magical, distinctly masterful, powerful debut introducing a singular voice and a truly global sensibility. It is as though Daniyal Mueenuddin arrived fully formed, his stories are well honed resonant works of art infused with a unique historical and intellectual consciousness. Mueenuddin’s compassion for the complexity and contradiction of lives where poverty and privilege exist co-dependently is at the core of his work. In these stories one feels the tug of familial expectation, the constant juggle of social, political, personal needs and desires, the tumult of old and new worlds colliding. These stories are written with a deep sense of knowing; as though Mueenuddin’s skin is a particular kind of porous; there is an ache, an inescapable constant melancholy, our masterful guide, knows too much, feels too deeply--if such a thing is possible. Mueenuddin is always on the outside and inside simultaneously—exposed and protected. Working in prose that is finely tuned, sparkling with sensuous clarity and authority In Other Rooms, Other Wonders draws the reader deep into a world that on the surface may seem foreign but is at it’s heart deeply familiar and human. 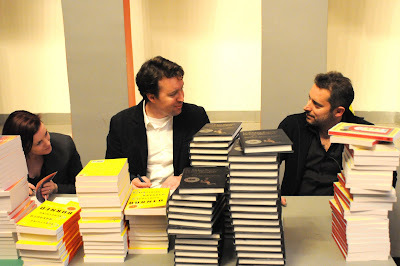 Before the The Story Prize event on March 3, 2010, at The New School University in New York, finalists Victoria Patterson, Wells Tower, and Daniyal Mueenuddin signed stacks of books for our bookseller McNally Jackson (which still has signed copies available). To see more photos, please visit our Web site. Early next week we'll post the judges' citations for the three books we honored that night: Patterson's Drift, Tower's Everything Ravaged, Everything Burned, and the top prize winner, Mueenuddin's In Other Rooms, Other Wonders. The finalists for The Story Prize (L to R) Wells Tower, Victoria Patterson, and Daniyal Mueenuddin (the winner), had lots of interesting things to say, both on-stage and off. Mueenuddin for instance, told me in a private conversation that he built and oversees a school for some 200 children from around the village where his farm in the southern Punjab region is located, partly as an alternative to the fundamentalist madrasas that are popping up all over his native Pakistan. 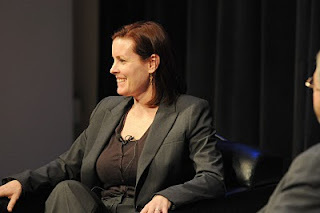 On-stage, Patterson confessed that in her struggles to find time to write she would sometimes leave her children in the church school on Sundays and sneak out to go home to work (earning an undeserved reputation for piety). Tower discussed seeking a magazine assignment to write about carnival people, in the hope of proving the stereotype wrong. Instead, however, he found carnies to be every bit as unsavory as they are reputed to be—maybe more so (as in his story "On the Show"). 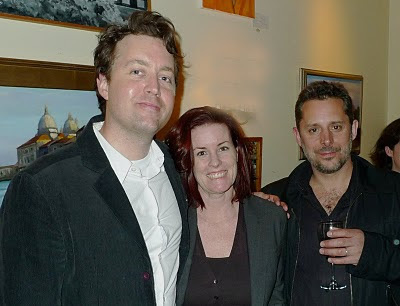 Thank you Daniyal, Tory, and Wells for being a part of The Story Prize's sixth award night. 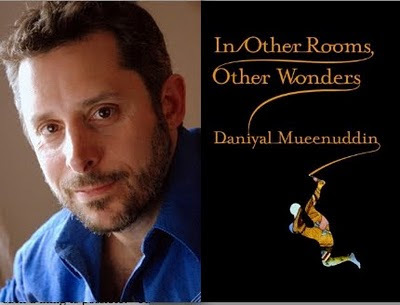 Daniyal Mueenuddin has won The Story Prize for his extraordinary collection of connected stories, In Other Rooms, Other Wonders, which center around a feudal landowner in southern Pakistan. Founder Julie Lindsey presented him with the $20,000 award and an engraved silver bowl at an event that took place at The New School in New York City on Wednesday night, March 4. The other finalists, Victoria Patterson for Drift and Wells Tower for Everything Ravaged, Everything Burned, each received $5,000. All three authors read from and discussed their work onstage. It was a pleasure talking to Daniyal, Tory, and Wells—and all three read beautifully and show incredible promise for more great work. March 3 is finally upon us. Tonight at 7:30 p.m. at the New School in New York City, Story Prize finalists Daniyal Mueenuddin, Victoria Patterson, and Wells Tower will read from and discuss their work. 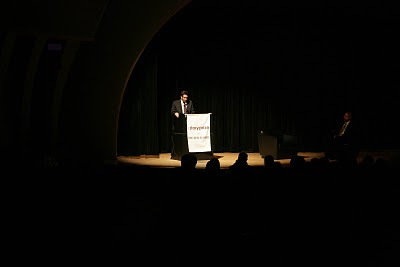 (That's Joe Meno reading last year.) At the end of the event, Founder Julie Lindsey will announce the winner. After 10 a.m., tickets will be available from The New School box office. If you can't be there (and I hope you can), look for news at around 10 p.m. A post will follow on this site at around midnight, and we'll start to put up pictures and links to coverage of the event on the mother ship in the days ahead. A podcast and Webcast will follow over the next few weeks.